SKYBOKX 109 Sports Bar & Grill, a mecca for New England sports enthusiasts, and aficionados of good food and drink! Located in the heart of MetroWest Boston, SKYBOKX 109 boasts the most sophisticated, expansive, and largest high definition sports entertainment system in the region. The 22 screens, up to 90” in size bring you so close to the action, that you’ll smell the turf! The entire design of SKYBOKX 109 cheers on the warm familiarity of your favorite neighborhood pub, while celebrating our heroes from college and the pros. And make no mistake, our heroes are all Boston-made! Old school guts and glory meets new world panache! Diners will experience classic New England favorites with an edge as sharp as Bobby Orr’s blades. Great food and drink rule the “BOKX”. The restaurant houses dozens of regional and local craft beers, premium cocktails and a menu that answers the call for a night out with family and friends or with the posse at game time. SKYBOKX 109 has 6 private and semi-private event spaces perfect for your next reception or dinner. Our private event sales manager will assist you with planning your event whether its a restaurant buy-out or a smaller event. We offer a wide selection of food displays. Please see the attachment for our full options. Please contact us for our complete terms & conditions. SKYBOKX 109 GastroSports, a mecca for New England sports enthusiasts and aficionados of good food and drink! Located in the heart of MetroWest Boston, SKYBOKX 109 boasts the most sophisticated, expansive, and largest high definition sports entertainment system in the region. The 22 screens, up to 90” in size bring you so close to the action, that you’ll smell the turf! The entire design of SKYBOKX 109 cheers on the warm familiarity of your favorite neighborhood pub, while celebrating our heroes from college and the pros. And make no mistake, our heroes are all Boston-made! Old school guts and glory meets new world panache! More than anything, SKYBOKX109 GastroSports champions the “Gastro” in GastroSports. Diners will experience classic New England favorites with an edge as sharp as Bobby Orr’s blades. Great food and drink rule the “BOKX”. The restaurant houses dozens of regional beers, premium cocktails and a menu that answers the call for a night out with family and friends or with the posse at game time. SKYBOKX 109's private dining area, the "Penalty BOKX" comes complete with plush seating, a pool table, video gaming, three large-screen televisions, and full service. Be it a birthday, graduation, awards dinner, bachelor/bachelorette party, corporate outing or otherwise, you're sure to make a splash at SKYBOKX 109. 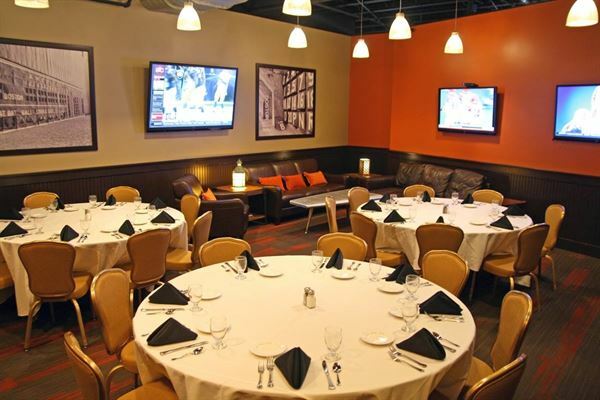 Atmosphere/Decor: A sophisticated dining room with eye popping sports themed art, billiards, gaming, and big screen televisions. Special Features: Plush seating, three big screen televisions, billiards table, video gaming, buffet area. A great semi-private area for casual events! Sidelines is a sunken area close to all the action. Sidelines can hold up to 30 guests! The SKYBOKX 109 Den area is perfect for small gatherings to celebrate, work, or relax. Atmosphere/Decor: The SKYBOKX 109 Den area is perfect for small gatherings to celebrate, work, or relax. Plush seating and a big screen television. The Scullroom is our newest semi-private event space inside SKYBOKX 109. This space is adjacent to The Den and to the main dining room. This room include two large TV for sports viewing or even slideshows. We used the Nantucket Room for a 70th birthday Party. The room was perfect and the service was outstanding! having access to the outdoor patio was a huge plus! I will definitely use this venue in the future. Rose was great to work with she was very helpful with ideas , accomodations etc. the bar tender was great the food was awesome and the space of the nantucket room fit our Bar Mitzvah needs great... We brought in Seacoast Events-games and had a great night! Special Features: Restaurant and Sports Bar setting complete with band stage for local, live music; six private and semi-private event spaces. Full Bar and Large TVs for sports viewing. Bar Louie’s warm surroundings, are filled with nightlife photography, hand-laid tile artwork and other local architectural touches. Beer and wine connoisseurs will be impressed with the extensive selection of imports, microbrews and 18 wines by the glass, while cocktail drinkers will revel in signature martinis, mojitos and margaritas made from the highest quality ingredients, fresh fruit and hand squeezed juices. Looking for an exciting place to host your next special event? Ski Ward is the perfect place; we provide the excitement, activities, food and more all for one low price! Whether you’d like a fully catered function, or a rental facility, we can accommodate your needs and keep it within your budget. We offer multiple indoor and outdoor areas, meeting services, a variety of activities, customizable food and drink packages and more - all of which can be a la carte or all-inclusive packages. Connect to the city in a new way at AC Hotel Boston Downtown, located at the intersection of past & present. Thoughtful service & modern design define our hotel in Boston. We cater to event and meeting planners looking to immerse their clients in the energy of downtown Boston. Our event space is sophisticated and flexible for meetings, small to mid-size weddings, vow renewal ceremonies, graduations, family celebrations and corporate events. *ASK ABOUT PROMOTIONS & INCENTIVES, GUESTROOM RATES. Welcome to an elevated state of mind. The only Crowne Plaza in MetroWest Boston. The VERVE-Crowne Plaza Natick is located just west of Boston; our MetroWest location is situated 18 miles from downtown Boston and Logan Airport in the corporate/retail hub of Natick, MA. Our MetroWest location places you in the center of culture, shopping, dining, local breweries and seasonal, outdoor activities. Within miles to Framingham State University, Babson College, Olin College, Wellesley College and Walnut Hill School for the Arts, we welcome guests touring and visiting these academic institutions. Our hotel is steps away from the Natick Mall, the largest retail concentration in New England featuring Neiman Marcus, Nordstrom, Macy’s, American Girl Store and The Container Store. Featuring more than 17,000 square feet of flexible banquet and meeting space, our hotel includes three ballrooms - Apollo, Phoenix, and Constellation, reception pre-function event and registration spaces, Stardust Plaza, as well as three smaller meeting rooms and a set boardroom. All of our meeting and event space is located on the lobby level of the hotel making it easy for your guests to find your event. Pre or post event your guests may enjoy our restaurant, Pantry, our our lounge, Violet Thorn. Located near the center of downtown Andover, Palmers has been a North Shore favorite for over 30 years. The restaurant features a large tavern and three dining rooms, two with fireplaces. An upscale Lunch and Dinner menu is offered daily and Tavern fare is also available throughout the day. Entertainment Cruises offers more than a venue on the water; we create unforgettable memories on Boston Harbor. Our fleet can accommodate any type of casual or formal event, from corporate and social outings to weddings and anniversaries, birthdays and much more. Show guests a new side of Boston with an event that’s sure to impress. Kings Dining & Entertainment sets itself apart as an unparalleled social scene for all occasions; be it a corporate event, holiday party, date night hotspot, team building event or just the best place in town to connect with friends, we are committed to making all occasions great and to treating you and your guests like Kings. Kings Boston - Back Bay is a 24,000 square foot facility featuring custom event packages from 3-to-550 guests, and proudly features: ° Chef-driven Restaurant & Lounge offering Award Winning Food ° Three full-service premium bars ° 16 Ten-pin bowling lanes (4 in the PRIVATE KING PIN ROOM) ° The Private Royal Room with 6 Gold Crown billiards tables, 4 Retro Oak Skee ball Tables and regulation Shuffleboard table ° Additional games including Bank Shuffleboard, 2 person and 4 person Air Hockey tables ° 40+ HDTVs and projector screens with Best-in-Industry Sound, Lighting and Music Environment Being the original Kings location, Back Bay Kings has hosted over 15,000 events since opening in 2003, this unique and memorable space, coupled with fantastic food & creative drinks has made Kings the place for events in Boston.